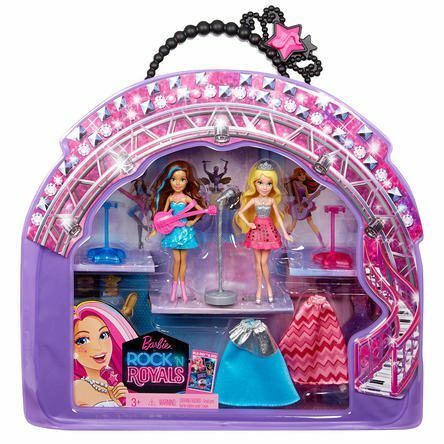 Mattel Barbie in Rock 'n Royals Play Set Just $9.98! Down From $19.99! You are here: Home / Great Deals / Mattel Barbie in Rock ‘n Royals Play Set Just $9.98! Down From $19.99! Mattel Barbie in Rock ‘n Royals Play Set Just $9.98! Down From $19.99! Sears has this Mattel Barbie in Rock ‘n Royals Play Set on sale for $9.98 (Reg. $19.99)! In Barbie in Rock N Royals, two very different worlds collide when a mix-up sends a princess and a rock star to the wrong camps. As they face an epic sing-off, both girls embrace their differences, find their true voices and learn that anything is possible when they work together! Girls will love celebrating the story with this pack that includes two mini-dolls, extra fashions and themed accessories. Everything is easily stored and carried in the vinyl bag decorated with iconic scenes from the movie. Princess Courtney and rock star Erika are both included wearing their cool finale outfits with trendy silhouettes and signature colors (pink and silver for Courtney and sparkly blue for Erika). Each also comes with a matching princess skirt (pink chevron for Courtney and blue and silver for Erika) to switch up her look. When they’re ready to perform, snap the mini-dolls into the two included doll stands to set the stage; a microphone stand and guitar add to the show. Girls can use the background scenes within the bag for even more play — the bottom features a performance stage, the top is decaled with camp scenes. Recreate favorite moments from the film with this fabulous set or play out new performances and stories. The bag with handle comes with two mini-dolls wearing fashions, two additional princess skirts, a microphone stand, a guitar and two doll stands. Dolls cannot stand alone. Colors and decorations may vary.